I live down in Wilmington, but used to live right outside of Garner. I've gone to every single AZ since 99. Over the last few years, schedules aren't released until 1-3 weeks before con, which is not helpful at all. AZ never had a band until Noize (that was mainly because of a contact they had). Kotoko was nice, but was unexpected, imo. Noize is what they have left, but are a huge draw. I'd rather then have had Balzac (who has US representation) like I begged them for (and gave them the contact info for) years ago. That is the worst dealers room I've ever seen. And I go back to the Hilton days too. I spent more money in AA than in the dealers room. The Mikimoto panel/signing was one of the very VERY few panels I even went to this year, and I'm glad I did. Yeah, I think I was one of the few who didn't bring dvds/books. 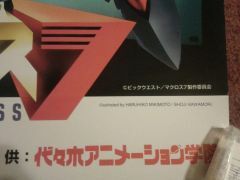 I got my Mac7 poster signed by him. when I unrolled it, he made a very audible "wow" when he saw it. Trust me, this isn't going anywhere. 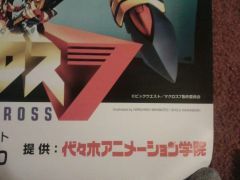 I actually asked 2 questions that he answered during the panel right before the autograph signing (What was his favorite series and would we get a manga story bridging the gap between SDF Macross and Macross 7). Toshi has been translator for AZ panels for MANY years (I've gone every year since 99), so this was normal for him. I would have asked a question as well if I was in his shoes. I wasn't really expecting a 100% Q&A, but it was a nice change. The only thing that irked me was that the panel people had to get into line for the signing session. 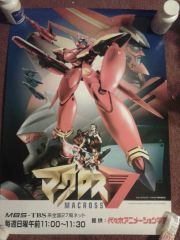 I'm planning on getting my Mac7 poster signed. 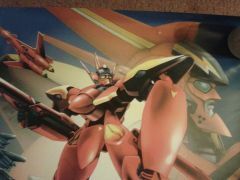 Announced yesterday was an appearance by Haruhiko Mikimoto at this year's Animazement in Raleigh, NC. 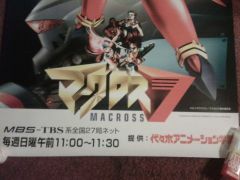 Any other Macross fans attending? That's the one I keep seeing. The one I have is smaller and different. Now I'm wondering if it's a boot or not. 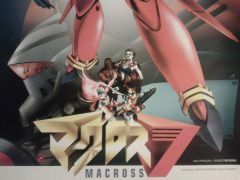 I picked this up a couple of years ago at Animazement and am now wondering if it is a bootleg. Any help would be appreciated.